Last week we had a really delicious dinner! 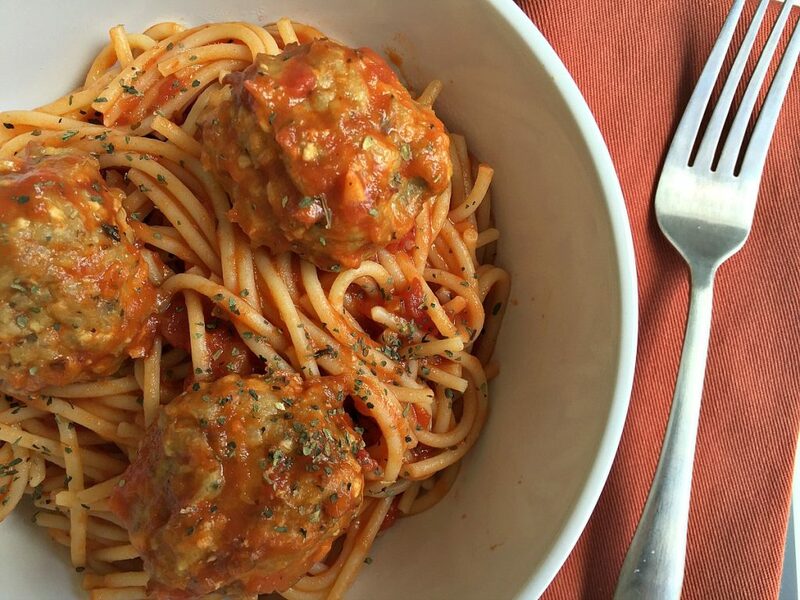 I was originally planning to make this Spaghetti and Meatballs recipe from Family Food and Travel. Unfortunately I didn’t have all the ingredients. Instead, I actually ended up just improvising with what we did have and created my own recipe for Homemade Chicken Meatballs. They were a hit with the whole family! 1. Put the ground chicken in a mixing bowl. add all the ingredients and mix them together until combined. 2. Take a large tbsp of the mixture in your hands and shape into a ball. Do that with all of the ground chicken mixture placing each ball on greased baking sheet. It’ll make about 16-18 meatballs. 3. Put the meatballs in the oven that is preheated to 400 degrees. Let them bake for 20-24 minutes. 4. While the meatballs are in the oven, cook your favourite spaghetti. We use this gluten-free brand. Add a can of your favourite tomato pasta sauce to the cooked and drained spaghetti. Then when the meatballs are cooked add them to the spaghetti. 5. Add a side of your favourite vegetables and dinner is served. This is one of our favourite and easiest recipes. These homemade chicken meatballs are not all great for dinner, they are perfect the next as lunch the next day for the kids at school! You can also make a double batch of chicken meatballs and then freeze them for a quick future dinner. I didnt know, making meatballs was so easy. WIll definitely try it. It totally is Dixya! I’ll have to check out your recipe. I need to live at your house!! haha This looks so delicious! Sounds good. I have never used cheddar cheese in meatballs! It was all I had on hand but it worked! The look yummy! And I feel the urgent need to watch “The Lady and the Tramp” again. This looks wonderful. I’ve only made quinoa veg meatballs so far, I need to get my hands dirty. lol. Used extra lean ground chicken, and added extra garlic (about 3 tbsp, since we can’t get enough garlic in our household!). Ooh, that sounds good. I’ll have to try it with noodles too.